Jesus was intimately familiar with the people and culture around Him. When He called the disciples to follow Him, He called them by name. When He taught the crowds who followed him, He did so using stories and imagery from the farming and fishing cultures folks were most familiar with. 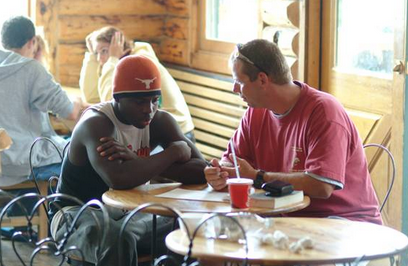 He was teaching, healing and leading people He knew. I would suggest that, as you serve the world for, with and like Jesus, the most important thing you can learn to do is listen. One of my favorite stories in the Bible appears in the eighth chapter of Acts. The story features two men. The first is a man named Phillip, who was a member of the first- century Church. The second is a traveler from Ethiopia. Phillip is on a journey south when he comes across this Ethiopian man, traveling in a chariot (an experience we can all relate to, I’m sure). Upon seeing the Ethiopian man in his chariot, Phillip hears God say, to him, “Go to that chariot and stay near it.” So, Phillip walks up to the chariot and stands there, listening. He is there long enough to hear the man inside is reading the Scriptures; Specifically, the man in the chariot is reading verses in the book of Isaiah that Phillip’s new Christian community would have also been reading. In other words, God was already up to something in that Ethiopian man’s life and Phillip only discovered it because he listened. Had he walked up to the chariot and immediately started talking, Phillip may have missed the moment entirely.